Ginger is easy to grow indoors at home, if rather slow. 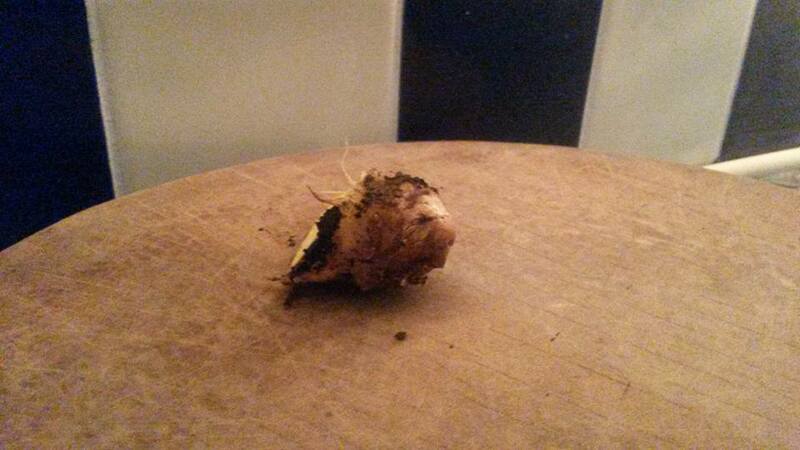 When you get a piece of ginger root that has started to sprout, just pop it in some compost in a flower pot. Cover it with a plastic bag, to keep it warm and damp, and then just wait. Ginger is herbaceous, which means that it will die back in winter, but come late spring it will shoot up again, with long, straight leaves that look a bit like a course grass or bamboo. I uncover it then, and stand it in water on a warm windowsill. It seems happy enough with this. Once the foliage yellows it can be pulled off, and the roots remain dormant over the winter. This is the best time of year to harvest your ginger. This piece was harvested by just slicing at an angle off the edge of the big clump. I want to get it well established, so I didn’t cut too much – but I needed some for a curry. Fresh, it is very juicy and much stronger than the root you get in the shops. This piece was harvested by just slicing at an angle off the edge of the big clump. I want to get it well established, so I didn’t cut too much – but I needed some for a curry. Fresh, it is very juicy and much stronger than the root you get in the shops.